For anyone torn between the performance of a European sport sedan and the unmatched attention to detail of a Lexus, choosing the GS won't require a coin flip. Even though the new GS delivers impressive performance figures, some people might still be hesitant to drop $50K on a luxury-sport sedan that doesn't wear a European nametag or offer a traditional manual transmission. The GS 350 receives a new 3.5-liter engine, making it the most powerful V6-powered sedan in its class. Inside, the GS expresses its enthusiastic character with sharp lines, perforated leather seating and attractive machined-aluminum gauge faces. Overall, the passenger cabin is a comfortable, sensible environment outfitted in wood, polished metal and leather. The backseat is also comfortable, offering generous headroom and legroom plus comfortable quasi-bucket seats that provide welcome lateral support on spirited drives. Technology fans will love the seemingly endless array of gadgets and gizmos, a phalanx so sophisticated it may turn off an equal number of buyers who feel one shouldn't have to be an MIT graduate to operate one's car. The fact that Lexus has managed to develop such a passionate following while wrapping its cars in admittedly bland styling speaks volumes about the appeal of quality and attention to detail that seemingly remains underestimated by many other carmakers. And while not a radical design by any stretch, the latest GS is the first to incorporate the company's new L-Finesse design philosophy that's meant to charge Lexus vehicles with more emotional appeal - and provide yet another reason for buyers to opt into the Lexus family. Perhaps the most notable design element is the fastback-style roofline that terminates in a very short rear deck. Interestingly, the current model evokes the first-generation GS much more than the second-generation model it replaced. While some luxury-sport sedans are built on the Three Bears theory - not too hard, not too soft, just right in between - the best ones manage to deliver high levels of both performance and comfort at the same time. Such is the newest Lexus GS. On the highway it's a cruiser, with comfortable seating and amenities and a ride that easily qualifies the luxury component of its dual-purpose nature. And when the road gets narrow and twisty, the GS is eager to keep pace with its European counterparts, even if its operator isn't armed with the same Teutonic intangibles. Even with a Manufacturer's Suggested Retail Price (MSRP) of $44,865, the GS 350 is a complete luxury car equipped with most of the traditional accoutrements except a moonroof. All-wheel drive is about $2,000 extra, while stepping up to the V8-motivated GS 430 runs at least $53,090. A look at the Fair Purchase Price gives an idea of the typical transaction price being paid for the GS in your area. It's a valuable tool to have before beginning negotiations, so be sure to check it often. As for value, the GS 350 is expected to retain excellent five-year resale values, on par with the Audi A6 and BMW 5 Series, but slightly below the new Mercedes-Benz E350. Even a "base" GS features a complete list of standard features that includes leather seating, keyless entry/start, xenon headlamps, heated 10-way power front seats with memory, four-way power adjustable steering wheel, seven-inch LCD touchscreen and four one-touch windows. Safety features include a full complement of airbags; front, side and knee airbags for front passengers and a side-curtain airbag protecting all four outboard passengers. Stepping up to the GS 430 adds not just the V8, but also an active suspension, variable gear ratio steering and a sophisticated active vehicle stability system, all of which are unavailable on the GS 350. Optional equipment on the GS sedan includes all-wheel drive (GS 350 only), Generation 5 Lexus DVD navigation system with rear backup camera, Mark Levinson Surround Sound audio system, rear park assist sensors, adaptive headlamps (standard on GS 430), pre-collision system with dynamic radar cruise control, moonroof, ventilated front seats and run-flat tires. Delivering true 5.1 Surround Sound through 14 speakers, the optional DVD-Audio surround system is one of the finest factory sound systems we've ever heard. To reduce cabin clutter, a cleverly hidden but easily accessed drop-down dash panel hides 14 infrequently used controls. The new 3.5-liter V6 in the GS 350 begs the question: Why opt for the V8? Of course the GS 430 does offer more torque and amenities, not to mention an advanced electronic suspension. Unless absolute power is paramount we think most people will be more than pleased with the V6. Lexus is moving to change its image as a producer of pure luxury cars to a producer of world-class luxury performance cars. The first phase in this transformation was launched last year in the form of the new GS sedan. Built to challenge the BMW 5 Series and Audi A6, the GS features some of Lexus' most aggressive styling and performance capabilities. Despite the advances in power and a taut new suspension, the GS still lacks one of the rudimentary tools desired by die-hard driving enthusiasts: A manual transmission. Without a doubt the best GS to date, the 2007 GS 350 and GS 430 afford Lexus its best shot at winning over European-leaning buyers. Alexis is great for families haven't had very many issues with it very comfortable and roomie. Gets good gas mileage for a SUV. No major issues on a car that is 10 plus years old. It is rear wheel drives it is not that great when accelerating on a rainy day. Tires like to spin when comes to contact with water. 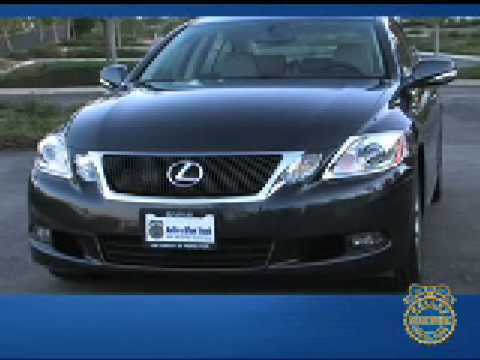 Lexus gs 350 with a 3.5 L engine. It is rear wheel drive. It is a third generation gs. It comes with rear backup camera and some models comes with backup assist sensors. Durability, functionality and loads of useful high tech features. Love the style, color, horsepower, comfort and handling of my car. Besides it's almost trouble free all these years. Lexus dealership is friendly and professional.